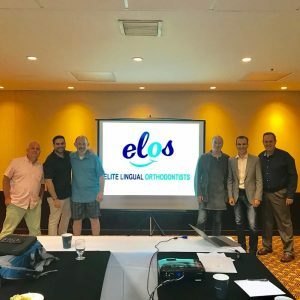 Riolo Orthodontic attended the first annual ELOS meeting in Miami Fl. this week. Our orthodontic practices represent 6 of the top practices in the country that specialize in lingual braces. These orthodontist have been using lingual braces orthodontics for at combined 75 years and have thousand of treated patient under their belts. Each of us bring something special to the table and we have have organized to meet as a study club to share knowledge to the benefit of our patients. not achieve the result they deserve with Clear aligner therapy alone (Invisalign). We have each evolved to used lingual fixed appliance to address the needs of our patients. Some patients require lingual braces in conjunction with Invisalign, others can only be treated with braces behind the teeth. Each of us have come to understand that many of our adult patient can only be treated aesthetically with braces behind the teeth (lingual braces) if we demand predictably excellent orthodontic results. Often treatment with Invisalign means that we cannot achieve the result these patient deserve. Each of us know that we can achieve the best result for our patient using lingual braces (Braces behind the teeth) becouse we do each and every day in our practices. As a group we have decided that we will not let our patient desire for aesthetic orthodontic treatment to interfere with the quality of their treatment result. ELOS is dedicated to the notion that our patients deserve to have both aesthetic treatment and excellent treatment results!